The annual New Year’s Eve events in Sarasota and on Siesta Key center around one massive and beautiful scene: the fireworks over the bay at Marina Jack. So, if you’re staying on Siesta Key at our resort, what are the best places to see the famous Sarasota New Years Eve fireworks at Marina Jack? The most obvious option is to get right in the middle of the action by visiting downtown Sarasota, just a quick drive from Siesta Key. The fireworks will launch at Marina Jack, a popular marina with boat cruises, public docking options, and a fantastic water view along with an upscale dining experience. It is located at 2 Marina Plaza, Sarasota, FL 34236. 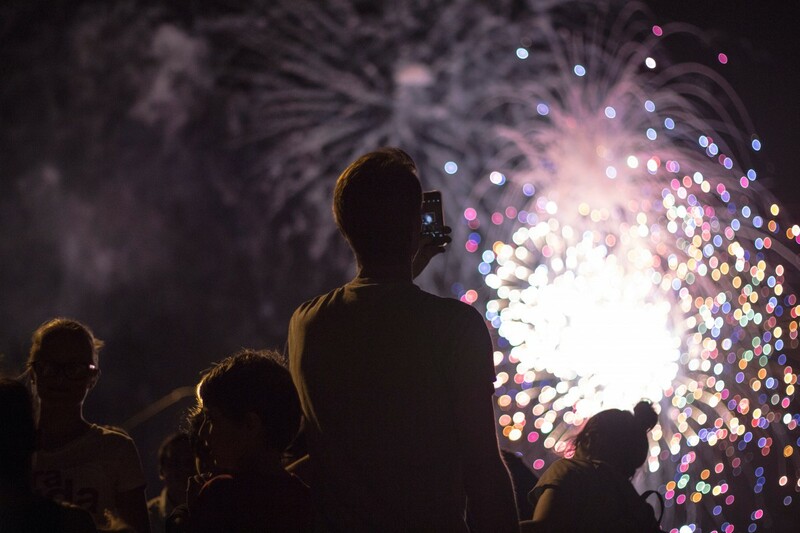 You can view the fireworks from Bayfront Park for free or at Marina Jack itself with its plentiful seating options, however if you plan on dining you’ll need to reserve a table by calling 941-365-4232. They also will be offering a celebratory cruise on the Marina Jack II from 8:30 pm to 12:30 am with party favors, a buffet, live music and dance floor for another excellent view. Marina Jack is only one part of the downtown Sarasota experience. While you are waiting for the fireworks, it’s a great idea to explore the area with your group or family. It is brimming with action and excitement, so it is the place you want to be to experience the many attractions. This will include live music performers and many participating local businesses with their own special sales and deals for the holiday. Many restaurants are expected to begin the festivities as early as 11am. There will be several vendors selling snacks and small bites to eat and beverage bars set up along Main Street. The main attraction is always the Pineapple Drop: a meteoric drop of a giant neon-glowing pineapple from the sky. The drop is at the corner of Lemon Ave and Main Street. This year, it is expected to coincide with the fireworks launch. Parking regulations are strictly enforced in the area, and it may be easier to get a ride in a taxi from Siesta Key rather than dealing with parking. There may be some visitors who want to stay closer to their Siesta key resort suite and avoid the downtown Sarasota traffic and parking headaches. Thankfully, it is certainly possible to have a great time here and you might be able to see the fireworks as well depending on the weather. If you manage to head to the northern side to Nora Patterson Bay Island Park, you may be able to capture a radiant view of the Marina Jack fireworks at midnight. A view is not guaranteed, but it is wonderful for families who don’t want to deal with the crowds and traffic while staying at our Siesta Key resort. Of course, the best place for dining and late-night fun will be in Siesta Village. A number of restaurants remain open late and will be hosting their own NYE themed celebrations, including the Daiquiri Deck and the Siesta Key Oyster Bar. Nora Patterson Bay Island Park is the closest public point where you can possibly see the Marina Jack fireworks. You may also see “unofficial” fireworks pop around the area. No matter what, you’ll get a panoramic and pleasing view of the bay. With so many fun-filled and energetic events on and nearby the island, Siesta Key is the place to be this New Year’s Eve! Call our Siesta Key resort hotel for more information about New Year’s Eve lodging, fireworks views events, and other information at (941)-349-1125.